← Tim Tebow: Love Him or Hate Him? I’ve been looking forward to this week for a whole year. I know, opening weekend was three weeks ago already (I was excited for that too! ), but this week holds a whole different level of intensity for me. Why, you ask? In one word: Michigan. 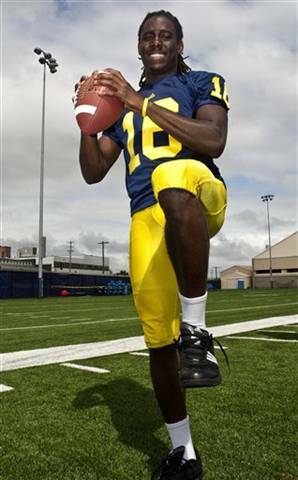 Two more words, Denard Robinson. ONE more word, and the most important, I might add… REVENGE!!! 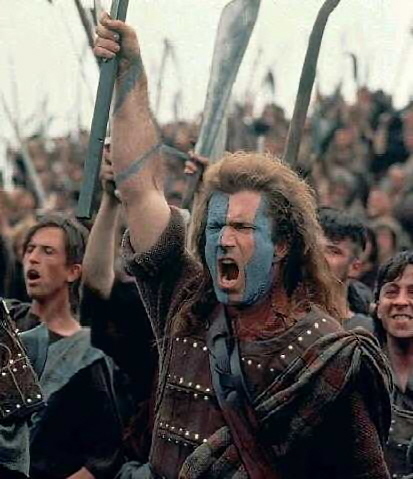 Now before I go all William Wallace on here, let me explain what fellow Notre Dame fans already know: we owe them a loss. Or better yet, they owe us a win, as we’ve coughed up the W to them in the final seconds our last three meetings. 2009: ND leads 34-31 with 2:19 left on the game clock. Tate Forcier goes 5 for 6 in a drive downfield that results in a 5-yard touchdown pass to Greg Mathews with 11 seconds remaining. Kick is good, blah, blah, blah, Notre Dame loses. *Side note for this game: Head coaches were Charlie Weis and Rich Rodriguez for this one. Cringe. 2010: The Irish overcome a 21-7 halftime deficit, while holding the Wolverines scoreless in the second half… until Denard Robinson scores from 2 yards out with 27 seconds left to play. Michigan wins 28-24. *Note: Robinson accounts for 502 total yards and three touchdowns in this, just his second-career start. My I-respect-you-but-loathe-you relationship with him begins. 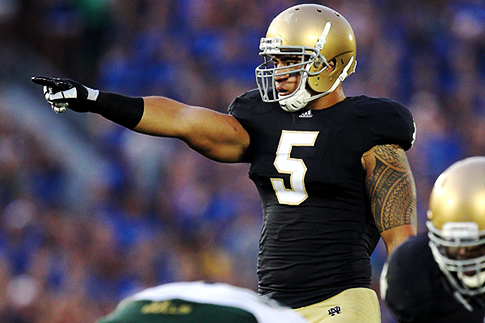 2011: Notre Dame enters the 4th quarter leading 24-7. I had already sent out some taunting text messages to a few Michigan fans at this point. Of course, Michigan comes roaring back, eventually leading 28-24. That score rings a bell, right? Well, the Irish have time to answer back this time, scoring a go-ahead TD with 1:22 remaining. What do I do? I go crazy. I pick up my daughter, swing her around, scream, cheer, and pose for the following picture (which I have never shared until this day, due to shame). I thought we finally had this one in the bag. But no. Robinson drives 80 yards to score with TWO seconds remaining. I am stunned. I am angry. My husband is scared. *Note: Two things in reference to the picture. 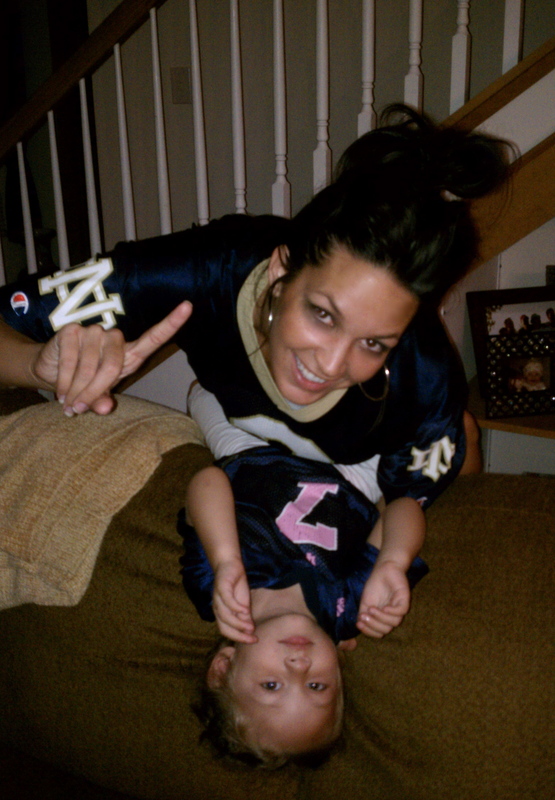 1) My daughter, Ava, was clearly not as excited as I was, and 2) I am guilty of one of my own pet peeves… holding up the #1 sign when we obviously weren’t #1. We were 0-2 entering the game. Geesh, Alexis. Alas, I digress. Now, I’ve never been a math whiz, but let me see…. 948 (Denard’s total yards vs. ND) × 7 (touchdowns he’s scored vs. ND) – 4 (the number of points ND has lost by each of the past three match-ups) × 42 (the combined number of seconds it’s taken for Michigan to score THREE game-winning touchdowns in the past three years) = ONE incredibly fired up and vengeful Irish squad this Saturday. Mark my words. Led by Manti Te-o, an inspired Irish defense is going to do something no group has ever done to Denard Robinson: tie his shoe laces so tight he loses feeling in his feet and can’t run at all. Just kidding, but they are going to get some stops. Robinson doesn’t have the protection up front he’s had in recent years. Plus, the Irish frontmen appear to be the best they’ve been in a while. I believe that this go-round is going to be very different. The old saying goes, “Hell hath no fury like a woman scorned.” Well, I am a woman scorned by Robinson & the Wolverines. I hope the Fighting Irish have the same mentality come 7:30pm this Saturday. Better yet, I hope Brian Kelly is drilling it into their brains all week long! My concern is with Android as a gainmg platform. Yes, Angry Birds plays well but I bought Reckless Racing on both my iPhone 4 and Nexus One specifically to test out performance and I’m sad to report that where the iPhone is fast and fluid the Nexus One is sometimes slow and choppy. I even overclocked the Nexus but I didn’t notice a big difference. This being Sony I’m sure they’ll have their own store with games specific to their hardware so hopefully it’ll be a better experience than on my Nexus One. I would still prefer a proper slide out keyboard with alternate gainmg buttons (think BlackBerry number keys over the letters). A good turn out at Marlborough to hear Andrew Kelly, Deputy Head of Tytherington, and two Governors, including the Head of Marlborough, exlapin clearly and positively the process by which they had arrived at this stage, and more particularly, to hear them reassure parents that IF the option chosen by CheshireEast did not best suit the needs of Tytherington Children, they would withdraw their support.Parents asked searching questions much like the Dean Valley parents.My own view again, which I was given the opportunity to rehearse, is that all the positive spin being put onto the option to absorb Macc High, depends on Central Government honouring their promise’ to finance the scheme (amounts between 5 million and 15 million were quoted) The Governors were asked by a Marlborough parent as to what would happen if the plan came adrift, was there a strategy to cover this? Would the moneis be withdrawn?I wondered if parents vote with their feet and sent their children out of zone thus creating a falling roll in Tytherington what would happen then?.I am aware that my spin might seem negative, but I speak from the experience of teaching in several schools that have undergone re-organization: it is a very very painful process for pupils and teachers alike. Limiting penalties and tunvorers indicates that the new coaching staff is doing a good job of teaching fundamentals, which should bode well for the Wolverines going forward. Notre Dame on the other hand desperately needs to limit tunvorers if they want to go to a BCS game this year.